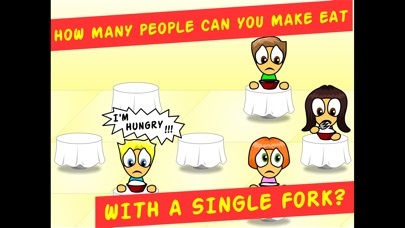 A funny game about swapping a fork between patrons in a restaurant! 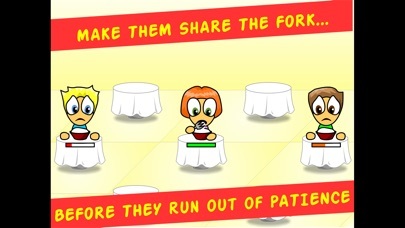 Many people are coming to our restaurant, but unfortunately we only have one fork! So our dear patrons will have to share it… even they don’t want to! Move the fork from one patron to another by touching them or their tables. The patience of each patron (represented by the gauge below them) slowly decreases when they are waiting for the fork. Help them to eat their meal before they run out of patience! How many people can you make eat at the same time with a single fork? 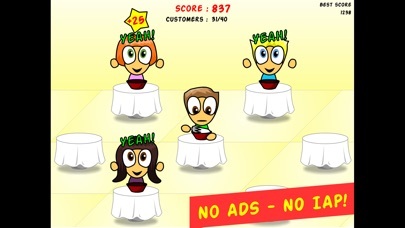 This is a real premium game: no Ads and no In-App Purchases.